Attica Tollway signs provide early information to any driver about his/her location on the tollway, the direction followed and the entrance and exit options. 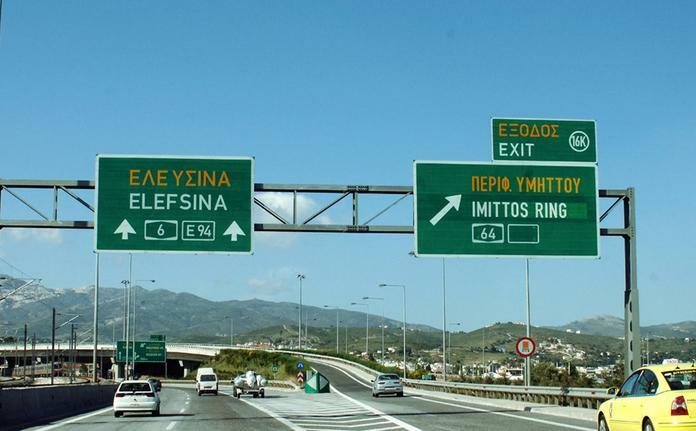 Before any exit, there are side and central signs stating the exit number and the destination or the road axis directly connected to the motorway, at the specific exit. Along the motorway, every 100 meters there are roadside signs marking the chainage points (kilometer position). These signs contain a letter index stating the direction and a number stating the distance in kilometers from a fixed reference point. The chainage signs are particularly useful in case of emergency, since they are the basic point of reference used by the Mobile Patrol and Intervention Units for locating the user. The speed limit is posted on appropriate warning signs all along Attica Tollway. At tunnel entrances, there are variable speed limit signs to be used, if the safe travelling speed differs from the speed displayed on the static signs. Inside the tunnels, every 150 meters, there are electronic message signs on the lanes showing which lanes are operational and which are not. Before any tunnel, there are warning signs reminding the drivers to turn on the lights of their vehicles. Lastly, there are signs indicating the nearest emergency telephone at 100 meter intervals along the motorway. Variable Message Signs (Variable Message Signs / VMS), located at the entrance and along the highway, provide updated, real time information for driving conditions (e.g, lane closed due to an accident, road works, buffer, etc. ).